I have often said that I don't pretend to understand the God in whom I believe. But I do believe (if not under the all-too-narrow constraints of some of my fellow believers). In my mind, pretending to understand a Force so much superior to myself is actually an insult to that Force. Could I be wrong? Sure. I don't think I am, but...I'm not the God I believe in; therefore, I am imperfect. 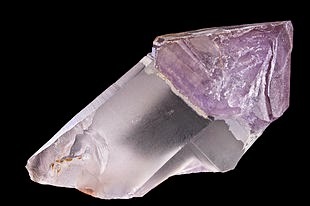 Some friends of mine, over the years, have believed very deeply in the healing powers of certain stones and crystals. Maybe that is a step more logical than belief in God. I don't know. But I admit, it seems "unscientific" to me. Let's say, I am an agnostic when it comes to that stuff. But here's the thing: we need faith in something. If a person wears a crystal around his neck and thinks it makes his shoulder pain go away, the result is positive. Maybe the stone did it; maybe belief helped the body. This is nothing new. But it is good for people, right? Some will say that it is a fostering of ignorance to encourage this sort of thing. Maybe. But maybe ignorance is a lot like innocence and maybe the world needs a little more wide-eyed wonder. This doesn't mean we stop going to doctors or that we stop applying logic to our quest for understanding, even in matters of spirituality, but that we should open our eyes to the possibility that we might benefit by the touch of the intangible and, yes, even the unprovable. My faith wavers, as it does with anyone else who has a mind. But I teach my kids a belief in God. It is a good thing for a child to believe he is being watched over; it is a good thing for a child to be able to pray. If I am right, prayer amounts to a helping hand from above; if I am wrong, it is, at the very least, good catharsis over the growing up years. Some day, they can draw their own conclusions as to whether Dad was right or wrong. Well, I know one thing: when I was doing battle with cancer, I, on one particular day, felt like I was reaching the end of my strength (emotionally). I went upstairs and I lay on the bed and I started just talking to God -- out loud, mind you. After about an hour of this, I got up and went downstairs to the family. My strength was back and, eventually, my body won. Why? Who cares. Faith helps. Someone who is theistic can live life as one big reductio ad absurdiam, stating (I trust in God. I don't know for sure if he exists, but assuming he does, this is how I need to live my life). Someone who is atheistic can live life the same way, stating (I trust in the universe. I don't know for sure if it exists, but assuming it does, this is how I need to live my life). Of course, the universe is universally (see what I did there?) observable, but to some people, so is God. We just don't know for sure.